The much-hyped meeting is upon us. 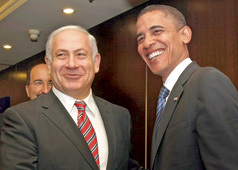 The Netanyahu-Obama summit. The government in Israel, democratically-elected and legitimately formed, is hot on Iran and cool on the Palestinians. The President of the United States, voted in and supported by 78% of America’s Jews, would seem to be pushing in the opposite direction on both issues. If Obama (with US Jews at his back) forces Netanyahu’s hand (irrespective of Bibi’s coalition at home) would this be a success for the Jewish people? Or would it be the ultimate failure of the Jewish state, whose sovereignty will have been given over to the will of United States’ Jewry? On the one hand, we might finally decommission the idea that the Diaspora has no say in Israel’s affairs. On the other hand, what of that old chestnut, “A free people in our land” – free even to make what others view as mistakes? Is Obama, and his Jewish support, a threat to Israeli independence?